Influenza (also known as flu, or grippe) is an acute inflammation of the nasopharynx, trachea, and bronchioles, with congestion, edema, and the possibility of necrosis of these respiratory structures. Influenza is a highly contagious infection of the respiratory tract caused by three different types of Myxovirus influenzae. It occurs sporadically or in epidemics which peaks usually during colder months. 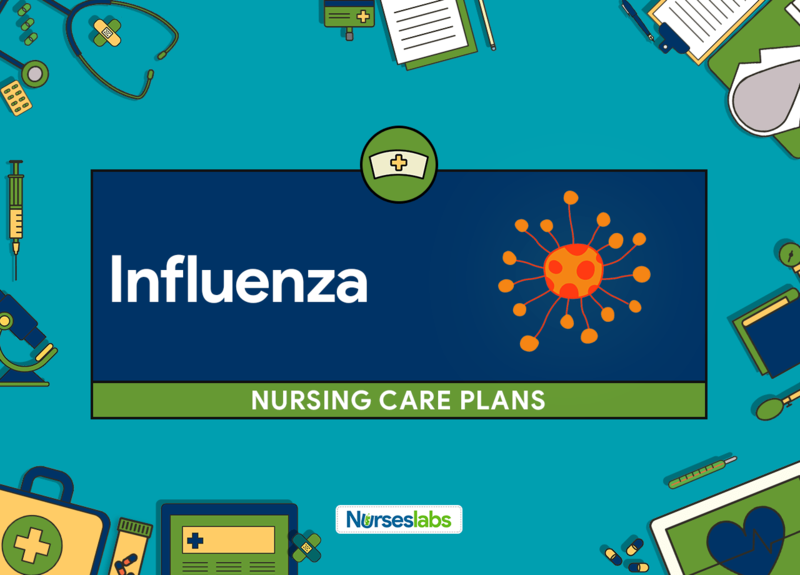 Unless complications occur, influenza doesn’t require hospitalization and patient care usually focuses on the relief of symptoms. Patient will achieve the return of and ability to maintain patent airways and respiratory status baselines. Patient will achieve and maintain a patent airway. Patient will have clear breath sounds to auscultation and will have respiratory status parameters with optimal air exchange. Patient will be compliant and be able to accurately administer medications on a daily basis, preventing exacerbations of the disease process. Patient will be able to cough up secretions and perform coughing and deep-breathing exercises. Assess respiratory status for rate, depth, ease, use of accessory muscles, and work of breathing Changes may vary from minimal to extreme caused by bronchial swelling, increased mucus secretions caused by oversecretion of goblet cells and tracheobronchial infection, narrowing of air passageways, and presence of other disease states that complicates the current condition. Auscultate the lung fields for the presence of wheezes, crackles (rales), rhonchi, or decreased breath sounds. Wheezing is caused by squeezing of air past the narrowed airways during expiration which is caused by bronchospasms, edema, and secretions obstructing the airways.Crackles or rales, result from consolidation of leukocytes and fibrin in the lung causing an infection or by fluid accumulation in the lungs. Decreased breath sounds may indicate alveolar collapse with little to no air exchange in the lung area being auscultated and usually results in poor ventilation. Administer oxygen as ordered. Monitor oxygen saturation by pulse oximetry, and notify the physician of readings <90% or as prescribed by the physician. Providing supplemental oxygen benefits the patient.High-level oxygen can cause severe damage to tissues, oxygen toxicity, increases in A-a gradients, microatelectasis, and ARDS. Oximetry readings of 90 correlate with PaO2 of 60 mmHg and levels below 60 mmHg do not allow for adequate perfusion to tissues and vital organs. Assess patient for pallor or cyanosis, especially to nail beds and around themouth. Although not a reliable indicator of the loss of airway patency, this may indicate hypoxemia. Cyanosis does not occur until a level of 5 grams of reduced hemoglobin/100 ml of blood in the superficial capillaries is reached. Monitor patient for cough and production of sputum, noting amount, color, character, and patient’s ability to expectorate secretions, and the ability to cough. Mucus color from yellow to green may indicate the presence of infection. Tenacious, thick secretions require more effort and energy to expectorate through coughing, and may actually create an obstruction stasis that leads to infection and respiratory changes. Position patient in high Fowler’s or semi-Fowler’s position, if possible. To promote maximal lung expansion. Turn the patient every 2 hours and as needed. Repositioning promotes drainage of pulmonary secretions and enhances ventilation to decrease the potential for atelectasis. Administer bronchodilators as ordered Promotes relaxation of bronchial smooth muscles to decrease spasms, dilates airways to improve ventilation, and maximizes air exchange. Perform postural drainage and percussion, as ordered. Postural drainage utilizes gravity to help raise secretions and clear sputum. Percussion and/or vibration may assist with the movement of secretions away from bronchial walls and enable patient to cough them up and increase the force of expiration. Some positions utilized during chest physiotherapy may be contraindicated in elderly patients as they may not tolerate intense percussion because of the fragility of bones and skin. Encourage fluids, up to 3-4 L/day unless contraindicated. Provides hydration and helps to thin secretions for easier mobilization and removal. Encourage deep breathing exercises and coughing exercises every 2 hours. Assists in lung expansion, as well as dislodgement of secretions for easier expectoration. Suction patient if needed. The patient may be too weak or fatigued to remove own secretions. Teach the patient or significant others regarding splinting abdomen with a pillow during cough efforts. Promotes increased expiratory pressure and helps to decrease discomfort. Instruct patient and/or SO on alternative types of coughing exercises, such as quad thrusts, if a patient has difficulty during coughing. Minimizes fatigue by assisting the patient to increase expiratory pressure and facilitates cough. Instruct patient on deep-breathing exercises and use of incentive spirometry. Promotes full lung expansion and decreases anxiety. Instruct patient and/or SO to avoid using milk, milk products, caffeinated drinks, and alcohol. Milk and milk products thicken mucus, caffeine reduces the effects of some bronchodilators and alcohol increases cell dehydration and bronchial constriction. Instruct patient to avoid excessively hot or cold fluids or environmental temperature extremes. May predispose patient to coughing spells, creating dyspnea, and bronchospasms. Instruct patient to seek help and stop smoking if the patient is a smoker. Smoking causes increased mucus production, vasoconstriction, increased blood pressure, inflammation of the lung lining, and decreased numbers of macrophages in the airways and mucociliary blanket. Instruct patient/family to avoid crowds and persons with upper respiratory infections when possible. Prevents possible transmission of infection to the patient who already is immunocompromised. Instruct patient/family in the use of inhalers, nebulizers, and medications. To provide supporting knowledge, and promotes the correct administration of medication for optimal effect.